Some of these auto-starting programs are executed so that they can check for updates; some are loaded at login so that they can quietly monitor your system, like an anti-malware utility, for example. Issues arise when too many of these auto-starting services and programs are added to the startup mix. Too many services loaded into memory at login may drastically slow down the time it takes for Windows to get into a workable state. Many Windows users have gotten back that spring in their PC's step by disabling unnecessary auto-starting programs, preventing them from running at login or bootup. It's annoying when a program chooses to load itself when you login, slowing down the works, and you may not even need to use said program. Msconfig is a capable tool, but for more information and settings on your startup programs, the free Autoruns (download here) utility is your best bet. I like programs that don't need to be installed. Autoruns only needs to be unzipped before it can be run. At first, Autoruns may appear intimidating and confusing. There are over 15 tabs on the main window that categorize all your startup programs and services. The first tab, "Everything", displays everything from all categories in one list. Take a moment to study some of the category tabs. The "Logon" tab is interesting, as it lists all the programs that execute when you sign into your Windows account. Scrolling through the list, you'll see a check box next to each program's icon and its name. Selecting the checkbox will allow the program to load upon login. You may see some important services that you'll want to have running automatically, such as your anti-virus program and your anti-spyware service. Others, like Java and iTunesHelper, for example, can be disabled to shave off some of the time it takes for Windows to load everything. To get more information about an entry, double-click on it, which will open up the Registry Editor, pointing you to the item's registry entry. If you do not want a program to load upon bootup or login, simply uncheck it to disable it. Autoruns will backup the program's information so that it can be reactivated should you check its box again. Right-click and select "Delete" if you never want a program or service to run. 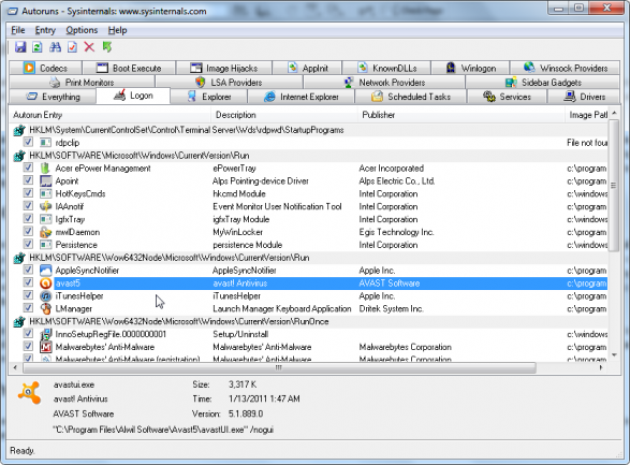 Autoruns is a fantastic utility that gives you enormous control and insight into all your auto-starting programs, services, and their locations. It picks up where msconfig leaves off and gives you a wealth of information about bootup and startup programs. Autoruns is free, doesn't need to be installed, and can help speed up your computer.